Well it's finally time! After months of waiting, I'm finally getting the chance to review some beers from Regular Guy Brewing Company. Some readers may recall my interview I did with Seth Treptow, one of the brewers from Regular Guy Brewing, that I did earlier this year. Right now, they are planning on opening up a nanobrewery in the St. Louis, Missouri area but for the time being, they're brewing in the comfort of a tricked-out garage. I received 3 beers from them last week and I was going to hold off reviewing this particular beer until I went through the others but temptation got the better of me. I give to you Smokey Grove, Regular Guy's Smoked Porter which is brewed with apples. Ever since I first heard about Smokey Grove, I've been curious to try it out and was actually about to get it back in May, but the forces that be broke the bottles while in transit. Luckily, things turned out differently and now I finally get a chance to try this out. First thing you'll notice about the bottle in the photo above is the label. I may not be the most knowledgeable about graphic design (even though I do dabble in Photoshop,) the label looks professionally done or could be passed off as such. However, my favorite part is the custom "Regular Guy Brewing" bottle cap. It's definitely going on my bottle cap fridge magnet collection! 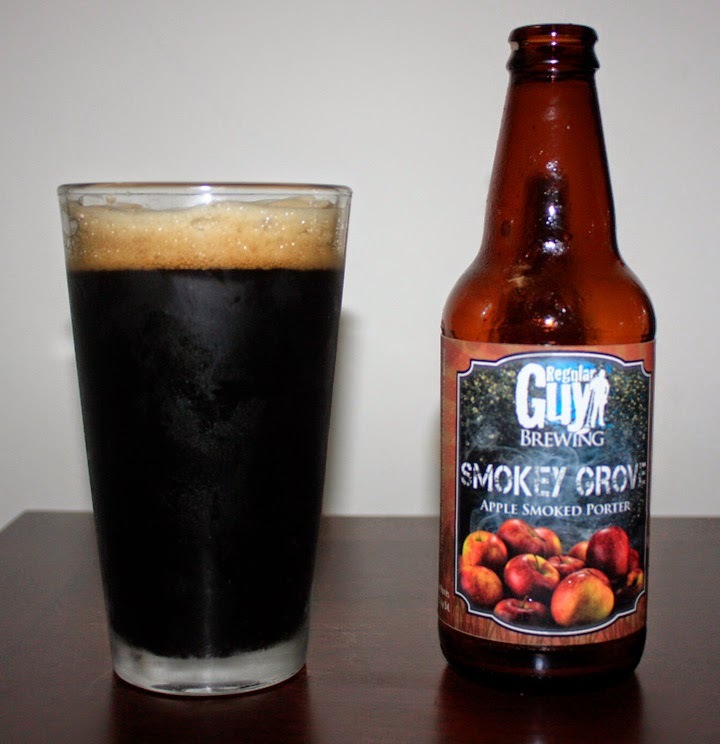 Smokey Grove pours a pitch black color with a very foamy head. The lacing retention is quite good and there is a hint of carbonation climbing up the sides of the glass. The nose has a strong smoked malt and apple scent. Also present in the nose is a prominent oak characteristic and a moderate roasted barley profile. It's like they took a rauchbier and infused it with apples. It smells like autumn. As far as the taste is concerned, smokey is right! That is because the smoked malt and apple flavors again take center stage in the overall taste itself with a solid roasted barley foundation with some chocolate notes and a very mild bitter hoppiness. As far as the aftertaste goes, it's more smoked malts and apple flavor that was present at the beginning. The palate is moderate in terms of body and carbonation. It's also got a bit of thickness to it as well, which is actually quite nice. If this were to, somehow, be made available in stores, I would be buying this on a frequent basis because this is an outstanding porter! Everything from the aroma and right down to the taste is rich and robust in its very own way. If I had it my way, it'd be available year-round but I can see this being an excellent fall seasonal. For the time being, the only thing I can do is wait until I can get this in stores.